Our tracked shutters are fitted to a specially made track, making them an ideal choice for patio doors or for dividing a room. As with all our styles, tracked shutters can be tailored to your needs. If you want a design for your bedroom, lounge or dining room then consider our timber and craftwood options. Alternatively, for the bathroom or kitchen you should think about our waterproof style. 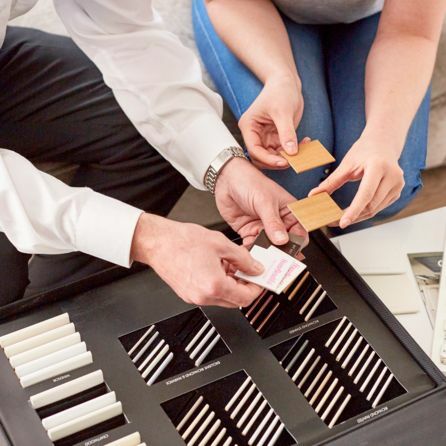 You can further tailor your tracked shutters by choosing whether you want a natural wood or painted finish, as well as the louvre width and even the hinge colour. Book an in-home appointment with one of our advisors and benefit from an expert’s advice while making your decisions. As well as offering you all sorts of tips, your advisor will measure the windows and give you a no-obligation quote.